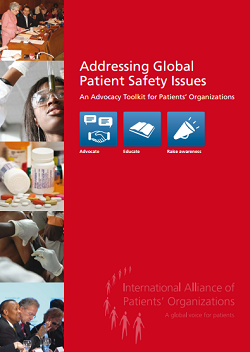 The Toolkit also provides advice and tips on how to advocate and build partnerships to achieve patient safety goals and on communicating messages to patients and other healthcare stakeholders. When we receive healthcare, we expect it to be safe. However, this is not always the case, with patient safety incidents affecting patients around the world, regardless of the status of national healthcare systems. The safety of patients can be compromised in many ways, including medical errors, counterfeit or substandard medicines, inadequate cleanliness of hospitals, and medicines not being taken correctly by patients. There are accompanying FAQs and checklists available too.